My real food journey has been quite a transformation in my cooking skills. My sister still likes to tease me that I can only make grilled cheese sandwiches. Sure, my grilled cheese is fantastic, but I can make quite a few other recipes now as well. I still can’t cook as well as my sister though. Shh……..don’t tell her I gave her a compliment. I’ll never hear the end of it! Little sisters……….what can you do with them? I spend a lot of time looking at recipes. I look at all sorts of recipes for my family. I don’t limit my search to just real food recipes. You may have noticed on my Facebook page, that I share lots of different recipes. If I find a recipe I like, I know I can usually convert it to real food. Sometimes, it takes a little experimenting to get it right, but usually one quick conversion and it comes out perfect. 1. Sweeteners: I use honey and maple syrup as my sweeteners because I don’t want to use processed white sugar. I’ve also found that I am better able to spot processed foods when I see sugar as an ingredient. 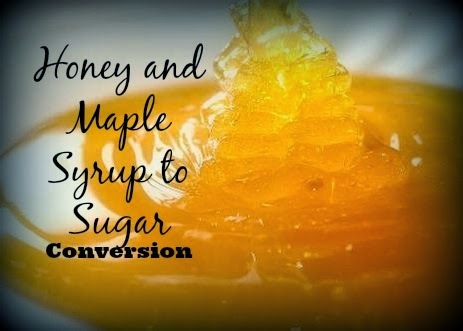 If my recipe calls for sugar, I substitute honey or maple syrup. It really is simple and always comes out delicious. I wrote a post about substituting natural sweeteners when baking that you can check out. There are a few things that I will use regular sugar for, but overall I have been very pleased with this easy substitution. I don’t even keep sugar in my house. When you switch to eating real food, you will find there actually is a whole new world of sweeteners available to use and none of them are sold in the sugar aisle of your store. Dates and ripe bananas are some of my favorites. Other fruits purees and applesauce work well too. Side note………I have also experimented with reducing overall sugar consumption. I have found that when a recipe calls for a cup of sugar that about 1/4 cup of honey or maple syrup will be sweet enough for my family. 2. Flour: I substitute whole wheat flour for regular white flour. I read a lot about using half whole wheat and half white. I suppose you can do that, but I’ve been very pleased with how the whole wheat recipes turn out. I substitute equal parts whole wheat flour or white whole wheat flour for white flour in my recipes. Sometimes they need a little more liquid, but I think my liquid honey and maple syrup sweeteners take care of that in my baking. If you think you need a little more moisture due to the “thirsty” nature of whole grains, add an additional tablespoon of liquid per cup of flour. 3. Fats: There are lots of recipes that call for vegetable or canola oil. I use olive oil which is known for all of its positive healthy properties. This is the oil I use when making salad dressing and cooking over medium to low heat. It will start smoking and break down at higher heat. When baking or cooking at high heat, I switch over to coconut oil. It can better handle the heat. And……don’t forget about butter……..ditch the margarine and enjoy butter. Nothing tastes better and butter is real food! 4. Condiments: This is the tough one. I’ll be honest, I still allow ketchup in moderation in my house. I have found the best ketchup my kids will eat and I stick with that. I try to use mayo in moderation as well. I will substitute plain yogurt or Greek yogurt in recipes. I make my own salad dressings. I have found that they are far more delicious than any of the bottled items. Enchilada sauce, pizza sauce, spaghetti sauce. I like to make my own, but with some searching I am finding some ready-made that meet my real food rules……..No artificial ingredients, added sugars, or colors. Make sure to check labels often. I have fallen in love with certain brands and then noticed that they switch up their recipes. Not all of the time, but it doesn’t hurt to keep checking. I would like to make everything, but time doesn’t always allow that. Label reading has helped me to keep things real. These 4 switches are an excellent way for you to start converting your favorite recipes to real food recipes. You don’t have to limit yourself in any way. Just find a recipe you like and start making the change to real food. Have you made the switch to real food yet? 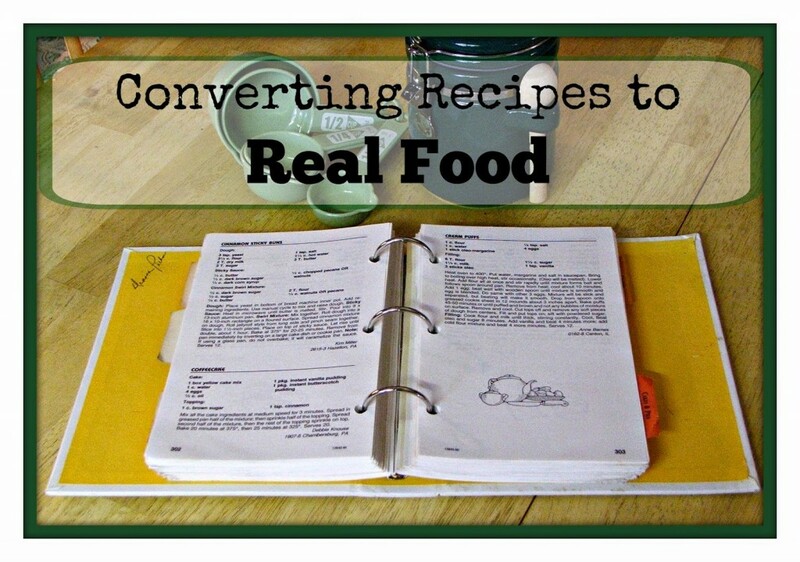 Do you prefer real food recipes or do you convert conventional recipes to real food? Some recipes are difficult to convert. Have you found one that is especially difficult? I do a lot of what you do. I do still use white flour, although occasionally I use gluten free flour instead. We do often sub honey and maple syrup for sweeteners, and use yogurt and coconut oil. Great advice! Thanks for stopping in Michelle! It's so nice to see you again. I find whole wheat flour more filling so I actually eat a bit less. That was a nice surprise. I've become a huge fan of whole white wheat and do the same as you. I don't even have white flour in the house anymore. I do find that I have to add a little extra liquid to some of my recipes when using it but other than that it works like a charm. I'm starting to replace all my sugar now with rapadura, a true whole cane sugar (not the fake "raw sugar" you can buy in the store). I'll be sharing about this on the blog on monday. Thanks for the good stuff here. My kitchen sure has changed Shari. I don't have white flour or sugar in my house anymore. It seems strange at first, but it is now the new normal. I look forward to reading your post about rapadura.